La Roche-Cotard site has been discovered at the beginning of the century but the mousterian level (La Roche-Cotard II) in front of the opening of the cave (La Roche-Cotard) has only been known for 25 years. This inhabited level has given a very particular object indubitably prepared by man with a flint having a natural pipe in which was placed a bone splinter. 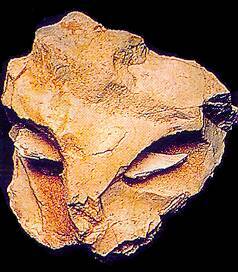 This object which looks like a human or animal face is an exceptional sign of the slow advance towards the birth of figurative art. Marquet & Lorblanchet, English abstract, Paléo, 2000. (2) the further "regularization" of the natural symmetry of the stone by flaking. The authors consider the object to be a "proto-figurine", and view it, together with the Berekhat Ram (possible) figurine, the bear face from Tolbaga (Siberia), and the curious Srbsko/Chlum sculpture as an "important document" or "premise" in the slow road to (later) Upper Palaeolithic figurative/representational art and symbolism." from Marquet & Lorblanchet , Paléo, 2000. In this dwelling site a very special object undoubtedly prepared by humans was discovered : it is a flint having a natural hole in which a small piece of bone has been placed. This object which makes one think of a human or animal face is an exceptional witness of the slow advance of humanity towards the beginning of illustrated art. The only dating obtained for this Mousterien site (which contained some rare tools) from the fragments of bone gives 32000 years "or more". from Thierry Koltes, ma.prehistoire first version. "NEANDERTHALIAN ART : REALITY AND ENIGMA"
[This] article gives some additional background on the Mask of La Roche-Cotard : History of its discovery, Michel Lorblanchet's interpretation and some other possible explanations of the purpose of this object outside the art domain. The discovery was made back in 1975. The object, "not an ordinary one", was then studied and stored, with the label "enigmatic object," among the non technical records of "Musée du Grand-Pressigny". When Michel Lorblanchet came to the museum, 20 years later, he interpreted the assemblage as a protofigurine coming out of Neanderthalian art . The article quotes Francesco d'Errico, researcher at CNRS in France : "it is possible to consider the object as a weight that may have been used to steady a tent, the bone wedged in the hole placed to facilitate stringing a rope ". The archeologist, who credits Neanderthalians with possible symbolic capabilities, remains skeptical with regard to the artistic character of the object. The conclusion calls for cautious interpretation of this object. Antiquity 77, n°298 : pp 661-670 (2003).